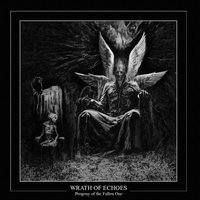 WRATH OF ECHOES is a Melodic Doom/Death Metal band from Canada, specifically Quebec City. Their latest, “Progeny of the Fallen One,” is their first full length, having released an EP called “A Fading Bloodline,” in 2017. Four of the five members are also in a band called DOOM’s DAY. As soon as the first track, “Lost Souls,” hit my ears with its sorrow and melancholy drenched intro, I was immediately reminded of INSOMNIUM but this is much gritter and their Doom aspects are even more up front. No doubt it is a sound that has been done by dozens of bands but WRATH Of ECHOES plays these seven tracks so well that might make them an act that will inspire others. The opening track is filled with lush guitar melodies, wonderful key passages, and some great Death growls from vocalist/keyboardist DAVID HABON. His clean vocals sound unique and are well placed into the songs but they come off slightly winy at times. The title track, “Progeny of the Fallen One,” is a song I found myself lost in. The build up to the vocals is lush and contains a depth of beauty maligned by lost hope. Patrick and Dominic fill the song with slow, melodic riffs that recall the glory days of the Gothenburg scene but with the Gothic tinged Doom of bands like MY DYING BRIDE and PARADISE LOST. Their sound and melding of these two genres are so well that no doubt this album can appeal to fans of both Melodic Death and Doom. The band doesn’t mind going into quieter, more introspective moments such as in the title track when clean guitars take over the song’s mid section with clean vocals riding atop. I found the ending of the song to be quiet moving because the whole band comes together with some really unique keys that work well with the melodic riffs. Benoit and Dominique are a fine rhythm section, allowing the band to stay grounding in heavy rawness so it doesn’t get overly melodic or too Gothic. In essence, the songs flow pretty well and I never found myself bored with this track, or any other. “Isolated,” is another standout track because it has such different parts that stand out from each other but still work together to create a cohesive song. The beginning finds beautiful keyboards coming before the Metal, adding a classy yet dynamic touch. David's cleans seem like they were made for this passage—as do his growls when the song switches gears and the Doom machine roars out of the gate. “The Weighting of the Heart,” is a song whose emotion is clear from the beginning, dripping with weighting candor. The keyboards and melodic guitar leads accent the best parts of the song but the bass can’t be discounted here either, melodic yet abrasive enough to keep the Death Metal elements in the mix. This is another album that came across my desk (I don’t really have a desk) too late but rest assured this is one of the better releases of last year for this genre.